Beautifully set for peace and quiet. 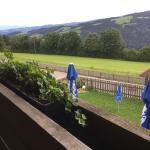 Get quick answers from Auf zu Sissy & Franz'l Hotel - Gasthof Deixelberger staff and past guests. "Ask for a room with balcony. Use GPS to find this place"